Rollerball, the Canadian-born director and producer Norman Jewison’s 1975 vision of a future dominated by anonymous corporations and their executive elite, in which all individual effort and aggressive emotions are subsumed into a horrifically violent global sport, remains critically overlooked. What little has been written deals mainly with its place within the renaissance of Anglo-American science fiction cinema in the 1970s, or focuses on the elaborately shot, still visceral to watch, game sequences, so realistic they briefly gave rise to speculation Rollerball may become an actual sport. Drawing on numerous sources, including little examined documents in the archive of the film’s screenwriter William Harrison, Andrew Nette examines the many dimensions of Rollerball’s making and reception: the way it simultaneously exhibits the aesthetics and narrative tropes of mainstream action and art-house cinema; the elaborate and painstaking process of world creation undertaken by Jewison and Harrison; and the cultural forces and debates that influenced them, including the increasing corporate power and growing violence in Western society in late 1960s and early 1970s. Nette shows how a film derided by many critics for its violence, works as a sophisticated and disturbing portrayal of a dystopian future that anticipates numerous contemporary concerns, including "fake news" and declining literary and historical memory. 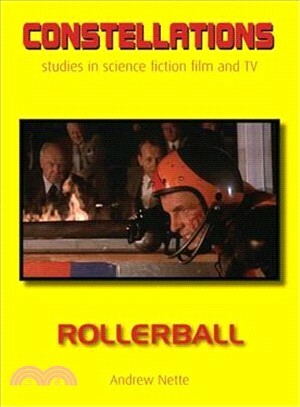 The book includes an interview with Jewison on Rollerball’s influences, making, and reception. Andrew Nette is the coeditor of Girl Gangs, Biker Boys, and Real Cool Cats: Pulp Fiction and Youth Culture, 1950 to 1980 (2017). He was a co-recipient of the Australian Film Institute Research Fellowship, examining depictions of crime and policing in early Australian television crime drama. He has written on film for a wide range of publications and organizations, including the Los Angeles Review of Books, Sight and Sound, the British Film Institute, and the Australian Centre for the Moving Image.